UM researchers study the pesky mosquito and undertake new strategies to eradicate the disease-carrying vector. The last time Diana Naranjo visited her native Ecuador, the heavy rains that are indicative of a strong El Niño had already started to fall, flooding many of the streets and neighborhoods of Guayaquil, city of her birth. But rain has never really annoyed Naranjo. A public health graduate student at the University of Miami’s Miller School of Medicine, she is more concerned with what it leaves behind—standing water that serves as an ideal breeding ground for disease-carrying mosquitoes. Health officials in Guayaquil, Ecuador, are partnering with researchers from the Miller School’s Department of Public Health Sciences to implement a new mosquito control strategy. 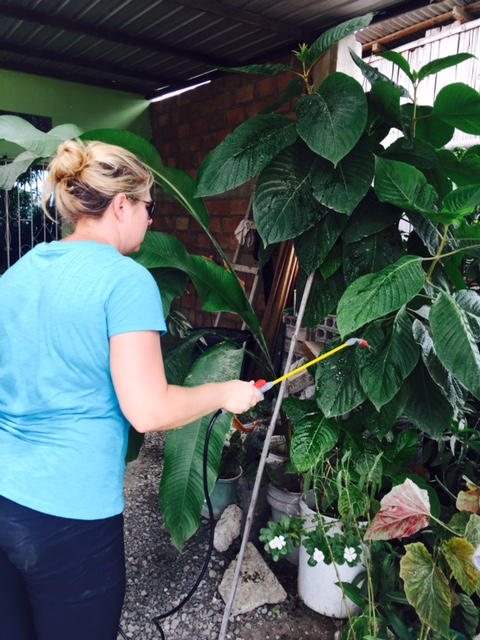 Whitney Qualls, a UM research scientist with the Miller School of Medicine, sprays insecticide on plants in Guayaquil, Ecuador. Ecuador is arguably ground zero for the study of vector-borne diseases. When the last strong El Niño hit the country from December 1997 through April 1998, torrential rains and rising sea levels triggered widespread flooding along the Pacific coast, causing more than 280 deaths, many from infectious diseases. Now, with Ecuador in the midst of another El Niño year and new research suggesting climate change could double the frequency of super El Niño events, government officials there are bracing for the worst. They’ve invested millions of dollars in water-management projects aimed at improving irrigation and preventing flooding. 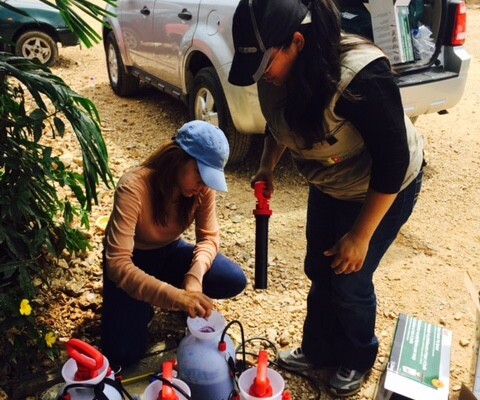 And in Guayaquil, Ecuador’s largest and most-populous city with about 2.7 million people, ministry of health officials have partnered with researchers from the Miller School’s Department of Public Health Sciences to implement a new mosquito control strategy that targets the sugar-feeding behavior of male and female Aedes aegypti. Qualls and Professor of Public Health Sciences in the Miller School of Medicine John Beier recently returned from Guayaquil, where they tested the strategy. Should it prove effective, they will urge the ministry of health to combine it with other mosquito-control measures already in place. 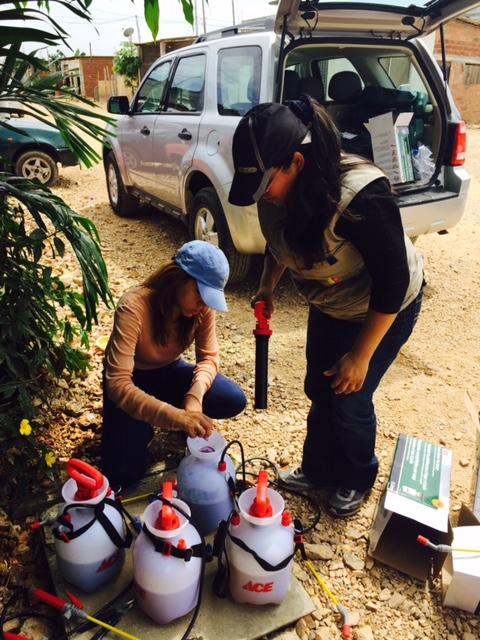 Whitney Qualls and John Beier, both faculty of the Miller School of Medicine, worked with localresearchers in Guayaquil, Ecuador to test an insecticide that works as an “attractive toxic sugarbait” method of eliminating mosquitoes. Beier, who also studies mosquito ecology and behavior in West Africa, knows better than anyone the importance of wiping out vector-borne diseases in countries like Ecuador. But it will take more than using tactics like the “attractive toxic sugar bait” method. Better drainage, more reliable water hookups to houses, and improved sanitation also is needed, he says. A member of the World Health Organization Vector Control Advisory Group, he hopes to never have to live through what he experienced more than a decade ago, when, as a professor from Johns Hopkins University conducting research in Kenya, he attended a funeral where hundreds of people mourned the death of a small child that had died from malaria.